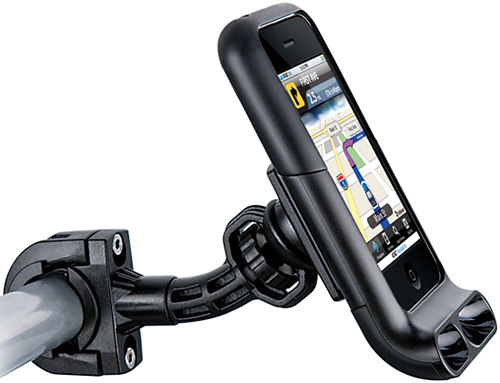 OZAKI iCarry Bike iPhone Amplifier | OhGizmo! By Andrew Liszewski on 05/10/11 • Leave a comment! It’s most definitely not the first passive speaker system for the iPhone that relies on physics to boost the performance of its built-in speaker. But I’m pretty sure it’s the first specifically designed to mount on the handlebars of your bike. The iCarry Bike L from Germany-based OZAKI includes a mounting arm that keeps your iPhone in easy reach when riding, yet fully protected, and a seashell-like bottom that both amplifies the sounds coming from your phone and those going to it. So in theory it should improve its speakerphone performance as well. But for the $50 they’re asking for it (according to The Gadgeteer) you’re probably just better off getting a Bluetooth headset and keeping your iPhone in your pocket.